♦ Study produces fully functional beta cells from artificial embryonic stem cells, according to a report in the San Diego Union-Tribune by Bradley Fikes, 4/15/2016 (and also sent to me by 3 different friends living in San Diego!). 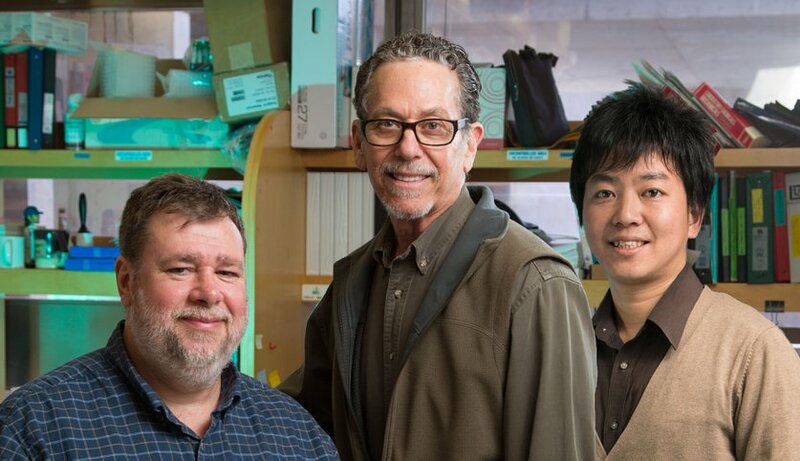 Salk Institute scientists say they’ve discovered a key ingredient needed to make functional insulin-producing beta cells. If these replacement cells can be implanted and protected, they will make insulin as the body needs, just as the original cells do. That means type 1 diabetes would, for the first time ever, be curable. 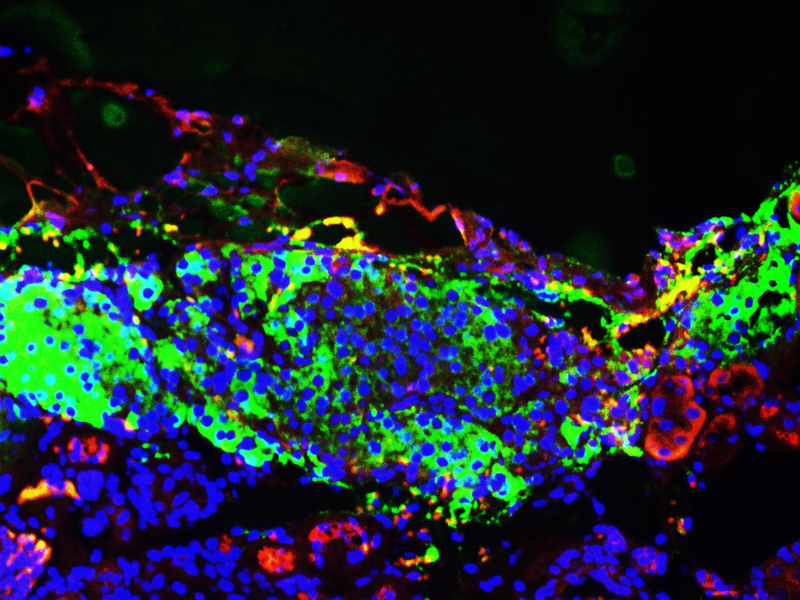 Salk scientists have created successful patient-derived pancreatic beta cells able to respond to glucagon (red) and produce insulin (green) accordingly. These cells (nuclei, blue) could be transplanted back into patients for a potential new diabetes therapy. The ingredient is a protein called ERR-gamma that turns up energy production in the beta cells, said Ron Evans, a Salk researcher who co-led the study with colleague Michael Downes. These cells are made from artificial embryonic stem cells, called induced pluripotent stem cells that are typically produced from skin. ♦ A Major Diabetes Mystery Solved, as reported on the Huffpost Science by Jacqueline Howard, 4/25/2016 and BBC News by James Gallagher, 4/24/2016. Scientists have previously known that the chronic autoimmune disease involves the immune system attacking four molecules, called autoantigens, in the pancreas. However, diabetes experts have long speculated that a fifth molecule must also be under attack — but they hadn’t been able to identify it until now. Researchers in the U.K. and Italy have discovered the fifth and final molecule, called tetraspanin-7. 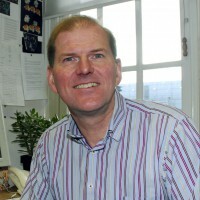 Their work could improve diabetes prediction and treatment, said Dr. Michael Christie, at the University of Lincoln in England who led the research. “The discovery that tetraspanin-7 is a major target of immunity in diabetes now provides us with a complete picture of what the immune system recognizes in individual patients, will assist in identifying individuals at risk through detection of antibodies to the protein and will allow the development of procedures to block the tetraspanin-7 immune response as part of a strategy to prevent the disease,” said Christie. ♦ Inconsistent Results Reported by Victoza Study in T1D, as reported on MedPage Today by Jeff Minerd, 4/13/2016. 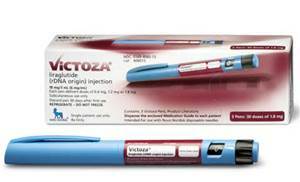 Adding daily liraglutide (Victoza) to insulin in patients with type 1 diabetes significantly reduced glycated hemoglobin (HbA1c) after 12 weeks, but only in patients receiving a 1.2 mg dose, according to a small clinical trial. Compared with a placebo group, the mean HbA1c reduction in patients receiving liraglutide 1.2 mg was 0.78% (P<0.01). In patients receiving the higher 1.8 mg dose, however, the reduction was a nonsignificant 0.42% (P=0.39). The results were also nonsignificant in patients receiving the lowest 0.6 mg dose, reported Paresh Dandona, MD, PhD, of the State University of New York, Buffalo, and colleagues. ♦ Life Expectancy Gap Exists Between T1 Patients and General Population, as reported by EndocrinologyAdvisor.com, Melissa Foster, 4/27/2016. So this is the “downer” news. According to a study published in JAMA in 2015, while life expectancy has increased among T1 patient and the general population, those with diabetes are likely to live more years with disabilities and die earlier than people without diabetes. The estimated loss of life expectancy among 20 year old T1s was approximately 11 years for men and 13 years for women. The bright spot for us ~ these findings were based on data from patients in Scotland from 2008 to 2010. However, researchers noted that their findings may not hold true for other nations or populations! YEAH!! !